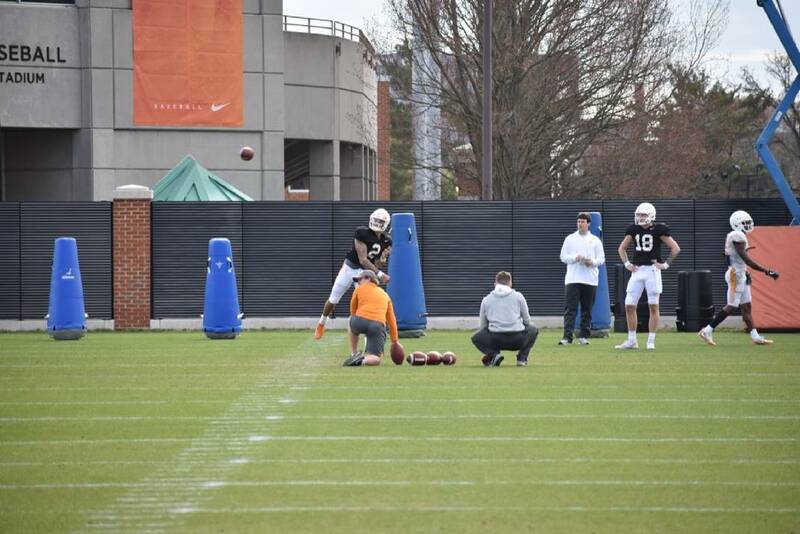 Tennessee quarterback Jarrett Guarantano throws a pass during practice on Monday, March 11, 2019, at Haslem Field. Photo by Gene Henley /Times Free Press. KNOXVILLE — For all sorts of reasons, the Tennessee football offensive linemen are looking forward to the rest of 2019. That's partly because 2018 wasn't a lot to write home about. Now five practices into spring workouts, the unit already has started to show improvement after being one of the team's more visible weaknesses a year ago. In the first year under then-offensive coordinator Tyson Helton, the Volunteers' offensive line was unable to consistently protect quarterback Jarrett Guarantano and backup Keller Chryst, each of whom became a hittable target virtually every time he dropped back to pass. Helton departed for Western Kentucky and was eventually replaced by former Georgia offensive coordinator Jim Chaney, a more experienced play-caller. That, along with another year with offensive line coach Will Friend and with strength and conditioning coach Craig Fitzgerald should make the line noticeably better this season. As for depth, the Vols lost three-year starter Drew Richmond but return Brandon Kennedy, who started the season opener at center but tore an ACL in practice a week later. And they have added five freshman offensive linemen, two of whom — Chris Akporoghene and Wanya Morris — are already on campus. Akporoghene has sat out the first part of spring with a knee injury, but Morris, a five-star recruit, has been able to come in immediately and start improving. So it's no surprise that the linemen aren't looking back. "You can't look back at the past, because it's a new team," junior Ryan Johnson said. "We're not last year, not the year before that; we're the team of 2019. We're focusing on ourselves — we're not focusing on anything else, and that's what you've got to do. That's what drives us, day by day, every day, getting better to be as successful as possible." The challenge is jump-starting a unit that topped 100 yards rushing only seven times last season — one that ranked at or near the bottom in nearly all offensive categories. Football isn't dependent on one person, but if it's dependent on one unit, the offensive line is the answer because the quarterback can't trigger anything regardless. So the coaching staff has been experimenting with different players at different positions on the unit. Jahmir Johnson was a starter last season at left guard; he's been playing left tackle this spring. Other guys have moved around, with the obvious purpose of finding the right combination. That, of course, will continue to be adjusted once talented freshmen Darnell Wright, Jackson Lampley and Melvin McBride arrive for preseason camp. "He's a guy that will be a left guard and left tackle," head coach Jeremy Pruitt said after Friday's practice of Johnson. "There's other guys that you play on the left side whether it's guard or tackle; there's guys that play at guard to guard; there's guys that maybe play center to guard; and every once in a while you'll have a guy that plays center and tackle or a guy that goes left and right. "So we've just tried to pick a lane with all of them and find ways to create depth and start figuring out our best five, six, seven, eight guys coming out of spring, and I think that's Jahmir, he's just playing left guard and left tackle." Pruitt's challenge last spring was just finding enough healthy bodies to piece together an offensive line for the spring. A year later, he's determining who goes where. "We're developing competition," junior Marcus Tatum said. "We have more bodies to make it through practice. It's good competition, and nobody should be scared of competition. "If you are, you're in the wrong conference."